Come! Let’s celebrate the occasion of amazing Christmas spirit in one of the most grandeur manner – with the Festival of Lights. This year, it is the eve of the 21st Annual Festival of Lights going to take place in the Lake Havasu City. It is a wonderful occasion to enjoy a stroll under the London Bridge along with your friends and family. Don’t miss it! The grand show of 21st Annual Festival of Lights is starting from November 25, 2016 and will continue up to January 1, 2017. You can enjoy the lighting show every day from 6 pm to 10 pm. 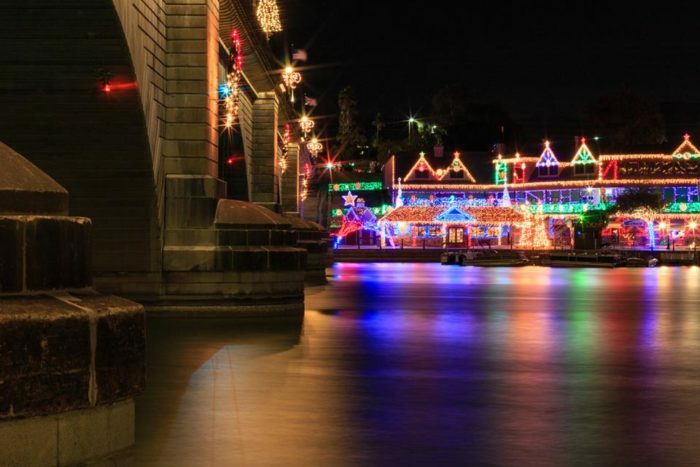 You would never see the Bridgewater Channel and its surrounding areas with such eye-catching beauty as more than 500,000 lights have been set to aglow the water of the Channel. There is no better way to celebrate the Christmas spirit when you take your boat for a night cruise through the Bridgewater Channel or just take a stroll through the walkway of the London Bridge. Like other popular events, the 21st Annual Festival of Lights does have a traditional perspective. People who live in Lake Havasu City and its surrounding areas throughout the year are well-acquainted with the tradition that Santa usually visits the place the day of the Thanksgiving. Now Santa likes to hang around Lake Havasu and its surroundings in order to escape from the cold. It is also believed that Santa makes some regular visits on every Friday and Saturday around 6 pm to 8 pm. So, if you want to be witness of some memorable events, don’t forget to visit the festival along with your camera so that you can capture some amazing photographs and create some ever-lasting memories. Good news! The entire show of the Annual Festival of Lights is absolutely free! You don’t need to spend a single penny to view the lighting show. You are facilitated with ample parking facilities free of cost available underneath the London Bridge. You will get these parking places in the English Village, Convention Center and the London Bridge Resort. Remember that lights will be off at 10 pm nightly. To view the 21st Annual Festival of Lights, two most suitable places are London Bridge Resort and the London Bridge situated in Lake Havasu City, AZ. If you are interested to know more about The 21st Annual Festival of Lights, you are requested to visit www.londonbridgeresort.com. You can also contact on the number 928-855-0888 or through email at info@londonbridgeresort.com. For detailed information or verification of any information, you are requested to contact the event coordinator. So, don’t miss the dazzling beauty of the London Bridge on the eve of Christmas with your friends and family until it will be too late that you will have to wait for the next year.